We have been totally inspired by the traditional, beautiful and extraordinarily functional Senegalese pirogues for the design of the hulls of the SIRENE DU SALOUM. The building technique is the stitch and glue, it's new to Senegal where the boats are still built with the semi-primitive and extremely cost effective systems but laking from the point of view of resistance, durability and water resistance of the hulls you'll get. Of course adopting modern systems can not solve all the problems and our first direct experience of building in Africa has been illuminating for understanding the potential development of the idea and the limits. 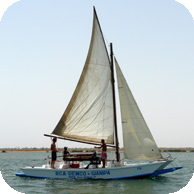 The boat is suitable for use as a charter daysailer and can accommodate up to 8 passengers and two crew.